Silicon Valley entrepreneur Tim Chae is betting -- $15 million, to be precise -- that in the next 3-5 years, Korea will be the Silicon Valley of Asia. And he says so because it’s the only country in the continent that meets the tech hub trifecta of being rich, relevant and cool. A decade after immigrating to the U.S., it only took one return visit to Seoul for him to find that its economic sustainability, political importance and cultural relevance propelled by the Korean Wave made it a place where billion-dollar valuation companies could thrive and “unicorns” could be discovered. That helped convince Chae to head the creation of the 500 Kimchi fund, the new Korea-focused offshoot from Silicon Valley seed investor and accelerator parent company 500 Startups. The fund was founded in February with plans to nurture 50-75 young local start-ups over the next three years. Several international players seem to be seeing the same chance. The entrance of 500 Startups is part of a flurry of activity that has swept Seoul’s start-up scene recently, with Google setting up a Campus Seoul incubation center here in May and investors like Japan’s SoftBank and the U.S.’ Formation 8 raising $1 billion and $100 million, respectively, for hot local start-ups Coupang and Yello Mobile. Despite its world-leading technology powerhouses like Samsung and LG, Korea’s start-up industry was an unturned rock to overseas influencers until a few years ago. In 2013, Chae, who grew up in Sacramento, California, was awestruck by its nascent start-up scene -- full of pillar companies like Kakao and Coupang, coinvestors, and young “next-generation” entrepreneurs who were excited about ditching the salaryman dream to code and build their own products. “I really fell in love with the start-up ecosystem here. I was surprised by the level of start-up activity here, and more so the quality of the companies,” he said. 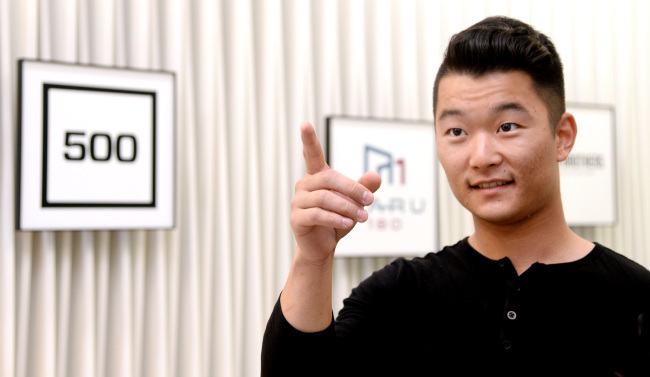 Chae started his own e-commerce site at age 13, ran a successful teenage nightclub at 17, dropped out of the U.S.’ top entrepreneurial school Babson College to become one of the country’s youngest venture capitalists at 19 -- one media outlet even hailed him as the “next Mark Zuckerberg” -- and burned out from his first venture-backed company at 22. After shutting down his 4-year-old start-up PostRocket, a Facebook marketing tool, he joined his investor 500 Startups as an entrepreneur-in-residence to mentor the accelerator’s seedling companies while planning his next move. During his 10-day trip to Seoul to represent 500 Startups at a tech conference, he met with 100 new companies back to back by his own volition. He saw the local scene as the hidden pearl in an oyster. “From the outside it looks like a rock. … But the moment you actually get in and you actually experience it for yourself, especially the start-up ecosystem here, you realize how special it is. And you’re hooked,” he said, noting the top echelon of those start-ups he met have probably raised a collective $20 million since then. Hooked as he was, Chae was also ready to move on from his position at the 500 family and go back to his roots. At the prime of his entrepreneurial years, he just wanted to build stuff. A turning point came during a sit-down with his mentor and investor Dave McClure, who shared his vision for 500 Startups -- whose name, borrowed from Dr. Seuss’ tale “The 500 Hats of Bartholomew Cubbins,” reflects multitasking entrepreneurs having to don multiple hats a day -- as a start-up in itself, something he grew from the ground up that has made over 1,100 investments worldwide since 2010. That is when Chae realized there was more he could do as an entrepreneur than start a software venture. He is no longer creating software, but instead gets to grow an ecosystem for other entrepreneurs to build their own. It is a different kind of entrepreneurship in which he said he has found altruistic value, and at 24, he has found his experiences come full circle. He says that while $15 million is a sliver compared to Korea’s economic size, 500 Kimchi’s effects will be tangible both in the number of start-ups it nurtures and in helping to attract overseas interest in Korean start-ups. Foreign venture capital firms are making heavy-handed investments into mature start-ups, but he hopes they will see more potential in betting on Korean companies in their earlier stages. Korean start-ups’ growth abroad is already palpable, he noted. The Korean-born e-commerce cosmetics subscription start-up Memebox, which raised $29 million in March, is proving to be a role model for the “next generation” of Korean start-ups after reportedly meeting great fandom in its recent expansion to San Francisco. Chae said he will be satisfied that he has done his job when he sees more of such Korean products and services becoming globally ubiquitous. For more info, visit kimchi.500.co. Start-up Seoul is a new series featuring players in Korea’s emerging tech start-up scene. This is the third installment. ― Ed.